The United Nations Secretary-General's Special Envoy to Yemen, Martin Griffiths, has threatened Yemen's Houthis group (Ansar Allah) with sanctions if it fails to implement the Stockholm agreement between the parties to the Yemeni conflict at the conclusion of peace talks in Sweden on December 13. According sources described as "credible" the Saudi daily "Okaz" reported on Tuesday, the that Griffiths threatened the Houthis to take punitive measures and resort to the UN Security Council to make decisions will be painful. The newspaper said that the UN envoy left on Monday, the Yemeni capital Sanaa, controlled by the Houthis, "empty-handed" after a two-day visit during which he held talks with leaders of the Houthis group, including the group's leader Abdulmalek al-Houthi. Griffiths could not convince the Houthis to withdraw their troops from the city of Hodeida, west of Yemen, and replace them with local troops according to the Stockholm agreement, according to newspaper sources. According to sources in the Yemen`s internationally recognized, the daily "Okaz" reported that Griffiths will meet in the Saudi capital Riyadh on Tuesday with Yemeni President Abdrabuh Mansour Hadi and the head of the government negotiating delegation, Foreign Minister Khalid al-Yamani, noting that the sources confirmed that the government's position is consistent and supportive of any Efforts leading to peace based upon the three references, and the full implementation of the Swedish Conventions, particularly with respect to Hodeidah and the prisoners. 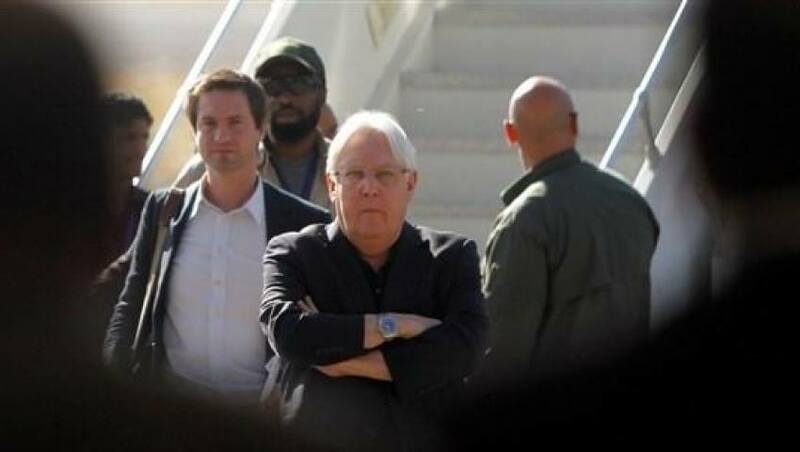 UN Special Envoy to Yemen, Martin Griffiths on Monday left the Yemeni capital of Sana'a without giving any statement on outcomes of his trip or meetings with Houthi leaders. Griffiths is expected to arrive in Saudi capital Riyadh, where he would meet with Yemeni President Abd Rabbu Mansour Hadi and his officials in a bid to help apply Sweden Agreement inked by two warring parties, though seems to involve difficulties. On Sunday, the UN envoy held meetings with rebel top leader Abdul Malik al-Houthi, head of Supreme Revolutionary Committee Mohammed Ali al-Houthi and other senior officials of the group, according to the Sana'a-based, rebel-run Saba news agency. Griffiths arrived Saturday in Sana'a, but he made no comment throughout his trip that dealt with withdrawal of two parties' forces from Hodeida City as stated in a pact facing obstacles to apply after nearly one month of its signature in Sweden. Having been brokered and published by the United Nations, the deal includes no timetable for withdrawal from Hodeida, by either Houthi rebels or official gov't troops that reached during fighting edges of the Red Sea port city. The UN envoy is hoping to bring two sides together by the end of January to go ahead with negotiations that commenced in Stockholm last December. Sweden Agreement stipulates that the ports of Hodeida, Salif and Ras Isa to be handed over to departments that had run them before Houthi takeover late in 2014, with the UN given a role in managing these ports. Two parties adopt interpretations totally different from agreements announced in Sweden, according to Yemeni political sopurces. Houthis say management of harbors should be handed to authorities present on ground, i.e. their personnel, while government says such responsibility should be re-delegated to department used to be there before Houthi "occupation". Houthis keep pressing for reopening Sana'a Airport to global flights, with a campaign launched for this purpose on their social media. They also had sick children lined up in reception of UN envoy on Saturday. Yemen has been racked by an armed conflict that broke out after the Iran-backed Houthis had ousted the internationally recognized government late in 2014. The conflict escalated after a Saudi-led coalition intervened militarily in the country in March 2015 to reinstate the government of President Hadi, leaving tens of thousands killed, hundreds of thousands injured, and 3 million displaced. The war has pushed the country to the world's worst humanitarian crisis, according to the UN, with more than two thirds of the 28-million population in need for a type of humanitarian aid and immediate protection, including 8.4 million people unsure how to get next meal, and some 2 million children suffering severe shortage of nutrition.